A journey of unsurpassed beauty, jungle vegetation, and exploding whitewater. For the adventuresome beginner and experienced rafter the class III rapids will have you filled with adrenaline as you paddle hard over the waves. Along the way you will be astounded by the awesome canyons, waterfalls, and primary rainforest of Costa Rica. The Savegre river is a magnificent stretch of whitewater that begins its course by winding out of a sparsely inhabited valley in the mountains. At the lower Savegre the whitewater rapids are exciting, but not so demanding that you won't have time to enjoy the Savegre's spectacular tropical scenery. This is one of the most pristine rivers in the country, and is surrounded by impressive views of the primary rainforest. Lurking just behind the shroud of lush foliage, you will find a number of truly magnificent waterfalls of the Savegre's tributaries. 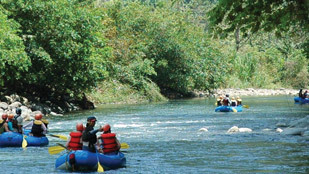 At the full day savegre river rafting you will visit a waterfall and get to explore the natural swimming pools in the area surrounded by blooming heliconias. World class whitewater rafting at only half an hour from the beach. The Naranjo is a Class III / IV half day challenge for more experienced paddlers. The Naranjo River drops steeply from the coastal mountain range above Quepos through a beautiful jungle gorge, and takes you on a wild ride to sea level passing nearby farmlands and palm plantations. The river banks are overgrown with jungle and the canyon walls meet the water at 90 degree angles. The whitewater, jungle, canyon, and sky make for an unforgettable day. For the advanced rafter, this is an exciting and refreshing ride through the Naranjo Canyon. As well, if you are a first time paddler who welcomes a challenge and is looking for the excitement of big waves, hydraulics, and stunning scenery, then this whitewater rafting trip is for you! Our exclusive fleet of transportation includes brand new Microbuses and 4x4 vehicles HUMMER and UNIMOG. More action with our high performance AIRE rafts, with the best design for our rivers. The best operations and reservations center, with our own private AMIGOS restaurant. Complete meals are provided on the tour, with no hurry to finish. Time is on our side. Our gear is U.S. Coast Guard approved and operated by pro - certified guides. We are a fully insured company. Our team of expert guides is formed by locals who have been brought up in the region and know the area better than anyone! From the owner to the reservations personnel we guarantee the level of safety and fun supervised by the Amigos del Rio team. We love what we do!